Audi quattro burst onto the scene in 1980, offering ‘grip, whatever the weather’ - Audi set about to prove this statement to be true, and the Bavarian brand certainly did that in style. 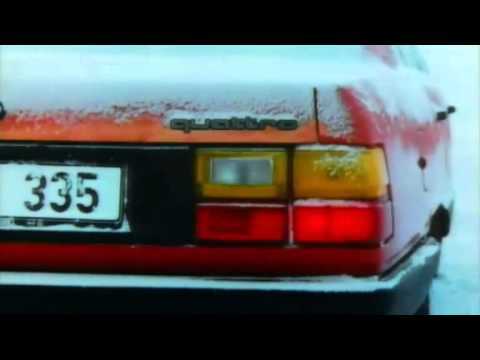 The quattro ski jump advert was released in 1986, showcasing the phenomenal grip of the Audi 100 CS quattro up a ski jump slope in Kaipola, Finland. The Pitkavouri ski jump was defeated, utilising quattro capability. To celebrate 25 years of quattro, Audi released a remake of the classic advertisement, using an Atlas Grey Audi A6 4.2 quattro. Travelling 47 metres off the ground at an angle of 37.5 degrees, equivalent to an 80% gradient, the quattro-powered Audi had no trouble ascending the slope at all. But how does Audi do it? A few clever considerations were taken into account to ensure the safety of the driver and the success of the task at hand: spiked tyres were fitted to the car, as are used in rallying; the six-speed tiptronic transmission was kept in first gear to avoid slight power loss when changing gear; and an ingenious safety device was fitted to the Audi and the slope. In rain, snow, ice and even everyday conditions, quattro can make a difference to combine precise control with dynamic responsiveness. With all four wheels working together, and power being distributed to where it’s needed, quattro helps to keep you safe on the road. Since the Audi quattro debuted in 1980, Audi has sold more than five million cars with permanent all-wheel drive. 35 years on, quattro technology has been enhanced and evolved, and is now better than ever before. Now available across the entire Audi range, contact Jardine Motors Audi to arrange a test drive in your favourite Audi equipped with quattro all-wheel drive – it really does provide ‘grip, whatever the weather’.